The new revised route for buses along Boulevard des Moulins has now started. Expectations are high for an improved flow in traffic. The hope is to improve travel times significantly and reduce congestion at rush hours. From this week the buses will be traveling in both directions on Boulevard des Moulins right up to the Madone roundabout. Having part of Boulevard des Moulins as a one-way system was causing enormous congestion as buses took the Saint Laurent and Saint Charles alternative route to the Madone roundabout. 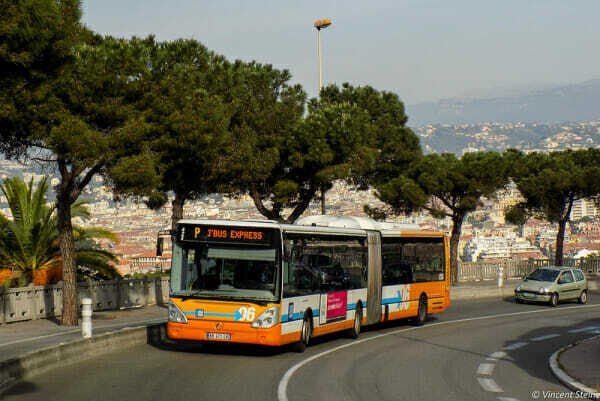 It should be obvious very quickly if the new system for buses makes the big difference anticipated – elimination of 15-minute traffic jams at rush hours and an improvement of five to eight minutes in travel times between Place des Moulins and Monte Carlo. About five thousand people take buses along this route each day. One other improvement has also been made. It is at the pedestrian crossing just above the Madone roundabout on Princess Charlotte. There is a new high-tech sensor installed in the approaches to the crossing which detects when people wish to cross. This will prompt “intelligent” traffic lights to stop and restart the traffic as needed when people are crossing. Good for safety and it should improve traffic flow as well. With buses now traveling in both directions along Boulevard des Moulins there will be no need for the bus stop at the church on the eliminated alternative route via Saint Laurent and Saint Charles. This is moved back to Regina on Boulevard des Moulins. This new system for buses will provide an opportunity for a number of changes and improvements in parking spots on Boulevard des Moulins and at Saint Laurent and Saint Charles avenues and on Princess Charlotte also. Some retailers and businesses along the streets with the new parking spots should hopefully experience improvements in access from motorists who need to park there. Obviously, there are also some losses in parking spots on Boulevard des Moulins to allow room for the buses to pass both ways. 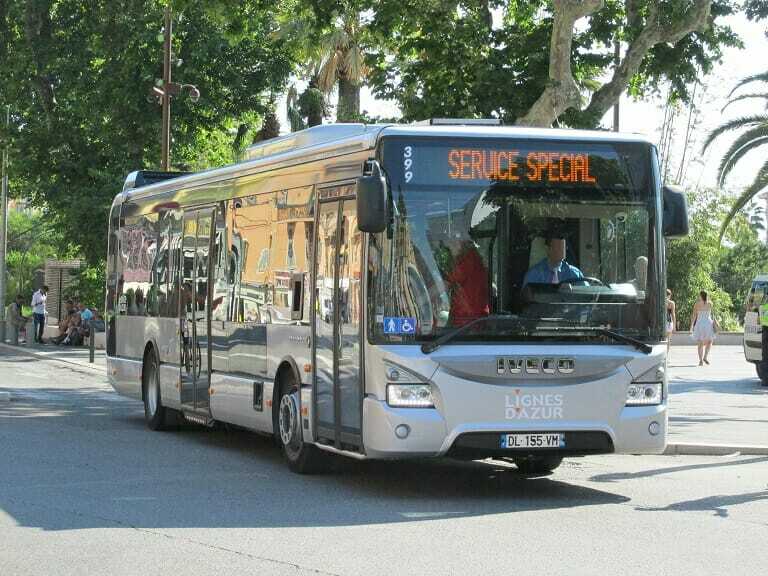 Bus route numbers 1 and 4 CAM, as well as double buses from regional line 100 Nice-Monaco-Menton, arriving from the Place des Moulins, will no longer take the narrow lane on Saint Laurent and Saint-Charles avenues, but will continue straight ahead between the bd. Moulins / Saint Laurent Ave and the Madone roundabout. Other vehicles will continue to join the Madone roundabout through the arteries that pass in front of Saint-Charles church. The “turn left” from Boulevard des Moulins to Saint-Laurent Avenue is maintained, particularly to facilitate accessibility for parents of children at the Saint-Charles School. In the direction of the Madone / Place des Moulins, on the right, there is a new parking space reserved for people with disabilities, 4 new spaces for heavy vehicles, a bike station (which was in front of the Regina), new spots for 2-wheeled vehicles, a temporary stopping area and a delivery space. 2-wheeled and heavy vehicle parking spaces have been removed along the sidewalk in front of the Regina. The Saint-Charles bus stop used by routes 1 and 4 CAM previously located on Saint-Laurent Avenue has been transferred to Regina on boulevard des Moulins, as it has been in the past. On the left side of Saint-Laurent Avenue there are 10 new heavy vehicle spaces, while on the right side there are 23 metres of spaces for 2-wheeled vehicles and a temporary stopping area. A new delivery spot in front of 27 boulevard des Moulins. The bus lane has been removed in order to create a two-wheeled lane, delivery area, 5 temporary stopping spaces and a stop for the CARF (ZEST) bus. The pedestrian crossing has been moved a few metres for safety reasons and has a new high-tech sensor and “intelligent” lights as a helpful aide. In total, 3 extra temporary stopping spaces have been created. The delivery areas have been redistributed on boulevard des Moulins. Both Sebastien Perret and Jean-luc Puyo have important roles and responsibilities for Urban traffic flow and mobility and they will be watching carefully over this revised system which will be tested for six months.